This past week's Photo Challenge P52 theme is School's Out. It's week 26, the halfway mark of this fun challenge. I have really enjoyed the first half and totally look forward to the second half of the challenge. We don't normally take a true summer break from school. Normally we do half days most the week and take whatever days off we want. This year, everyone agreed that we just really needed a long break from formal school time. I can't believe how fast the month of June just flew past us like lightning. And just to state the obvious, it's already July! Such craziness I tell you. Our first official day of the new school year is the last week of this month. We are going to start school with the Olympics doing a lapbook and unit study to go alnog with the games. I have so much planning a prepping to get done it's quite crazy. The kids however are having fun playing all day and creating some very cool stuff. Like their own water slide. They did this last year but someone was always holding the hose or they would water it down in between each pass. This year, duct tape is holding the hose quite nicely. 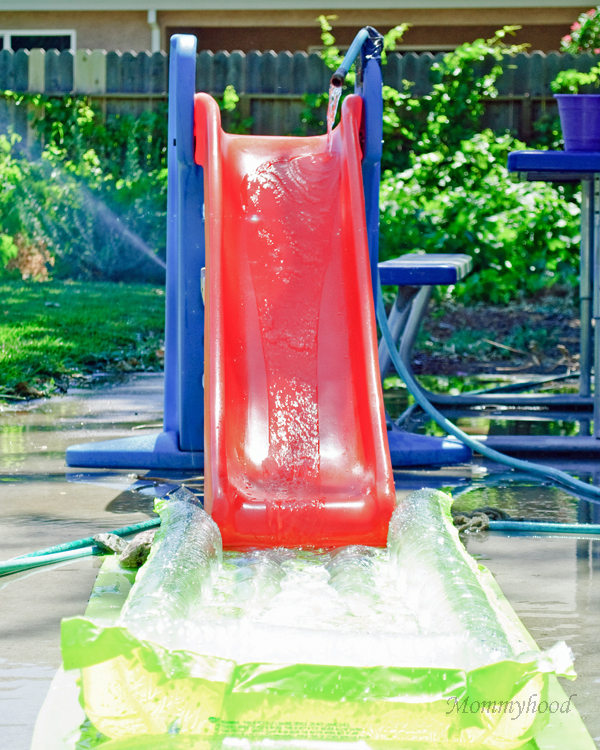 And this is what a homemade water slide looks like. I love how creative my kids are. And the ingenuity my kids have. It has been a lot of fun watching them learn when they think they are on break.